Each intern in the Nature Academy internship program at Matthaei Botanical Gardens & Nichols Arboretum chooses a summer project to research and report on. The project culminates in a poster displayed in Matthaei’s public indoor spaces. Interns also write a blog post about their project concept or the research they’ve conducted. Throughout the long and varied expanse of human history, people’s lifestyles have been shaped by food. Whether you shop at your local farmer’s market or a megacorporate grocery store, whether you stock up on fruits and veggies or prefer frozen burritos and Domino’s Pizza—you spend a lot of time, every day, thinking about, buying, preparing, and eating your food. In other words, food is important. 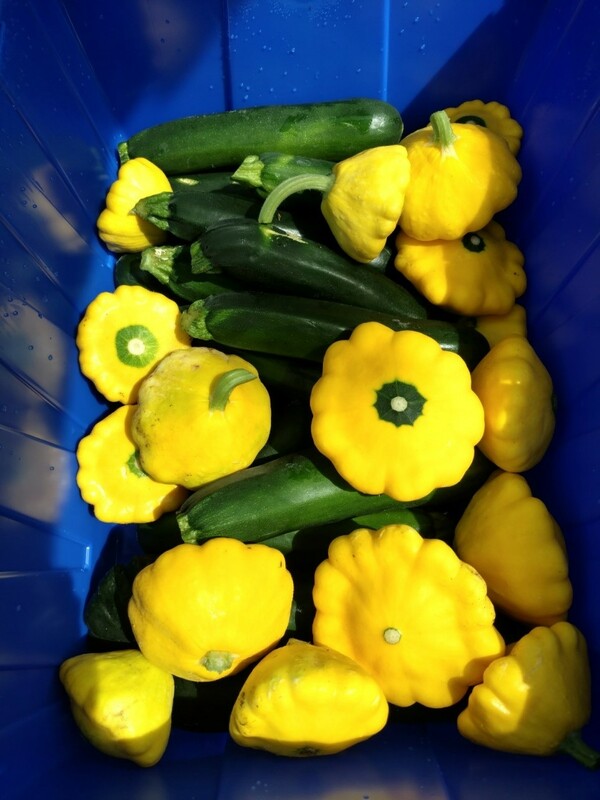 As a Campus Farm intern working with Matthaei-Nichols this summer, I spend even more time working with food than most. 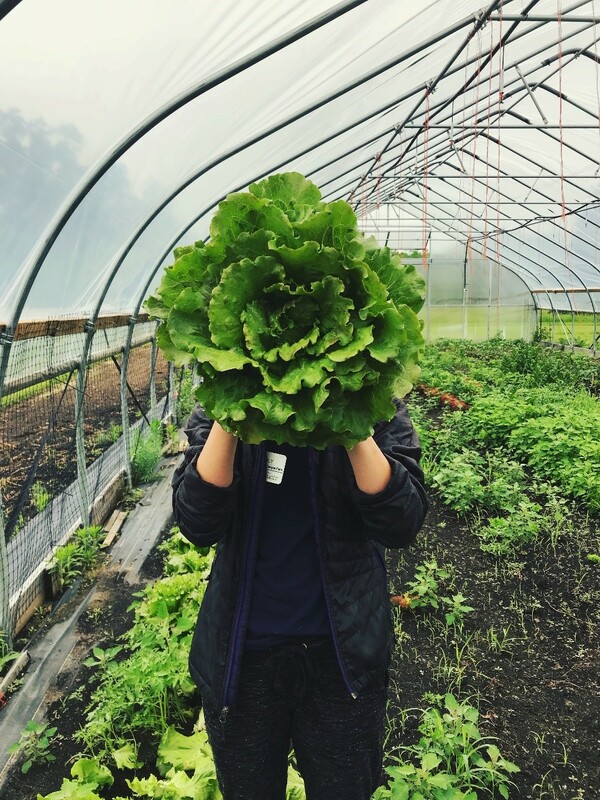 Our days at the farm are jam-packed with growing and taking care of fresh produce that is ultimately bound for the University of Michigan dining halls. We shepherd our products from seed to field to harvest to package to kitchen to compost, and then we come in the next day and do it all over again. It’s not always easy work, but it’s incredibly gratifying to spend time on a sustainable farm with people who care so deeply about their food and their environment. The author with a head of lettuce. Some of the fruits of the Campus Farm. Because our work can be so physically demanding, I’m always thinking about ways to make things easier. And thus, the idea for my intern project was born. My roommate has the good fortune to work with Dr. Evgueni Filipov, a University of Michigan civil engineering professor who is doing a lot of research and work on deployable structures. (Take a look at some of Professor Filipov’s projects here.) As my roommate and I exchanged stories about our workdays this summer, we began to see the ways in which our work could potentially intersect. We bounced some ideas off each other and eventually settled on an idea for a deployable hoop house. Usually, a passive solar hoop house is a structure designed to operate like a greenhouse while using only the energy from the sun to keep the interior warm enough for plants. The basic design consists of inverted U-shaped metal poles which are anchored somehow to the ground, with a transparent sheet of plastic laid over the poles to form a tunnel. The plastic then traps light and heat from the sun which allows farmers to extend the growing season of plants that would normally not tolerate colder temperatures typical of early spring and late fall. In some cases, as with spinach, the crop can be grown year-round with no issues even in midwinter. The interior of one of the Campus Farm’s three hoop houses is pictured here. Produce growing in a hoop house at the Campus Farm. 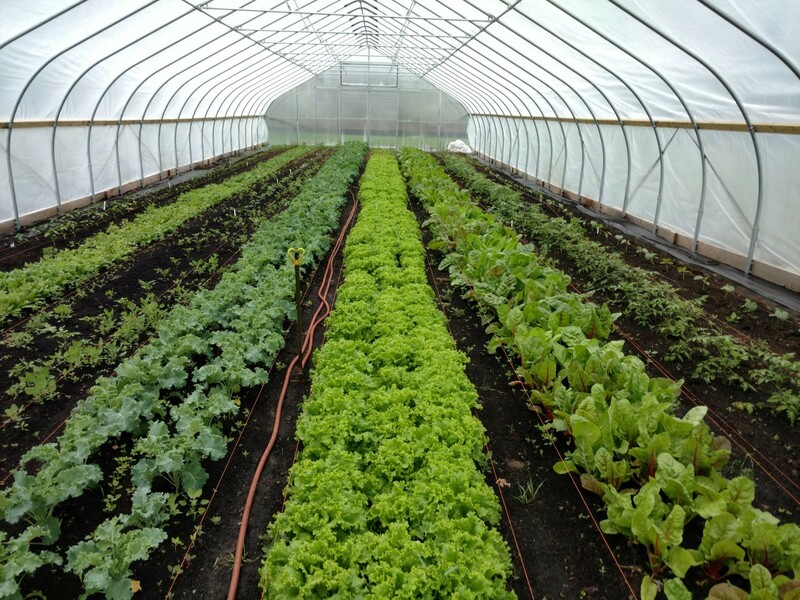 These traditional hoop houses can take hours to construct by hand, as is often the case, and require more materials than a deployable hoop house would. In the case of a deployable hoop house, with a design imitating what I propose, the structure could be constructed in minutes, cutting down on labor and materials at the same time. This kind of technology is still in the early stages of research, and such a large structure has yet to be manufactured. My goal with this project is to apply an engineering technique to a field which otherwise might be overlooked, creating an interdisciplinary design that benefits everyone involved. While these ideas are purely theoretical for now, the thought of this kind of engineering becoming commonplace in the future is exciting. 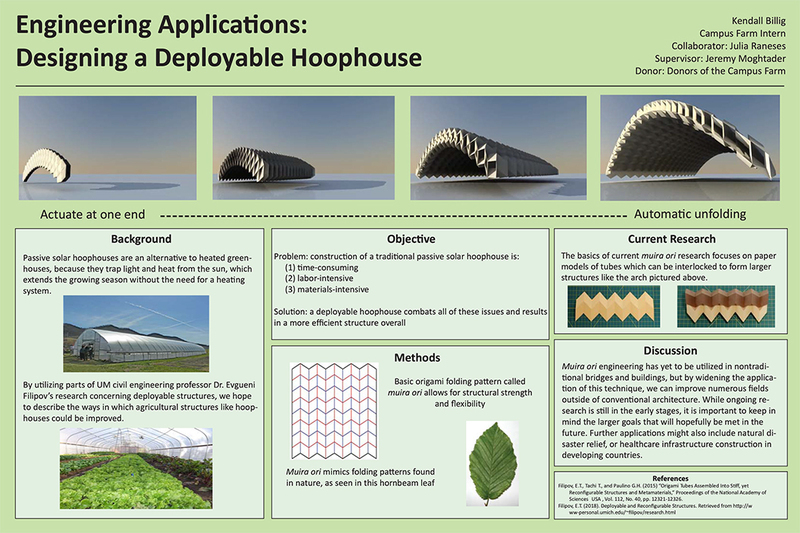 For a visual representation of the deployable hoop-house concept, see my poster below. To read more about Dr. Filipov’s research on deployable structures, click here. Kendall Billig, from Brighton, Michigan, was a Campus Farm intern this summer. She is a rising junior studying public health sciences with a minor in English literature. 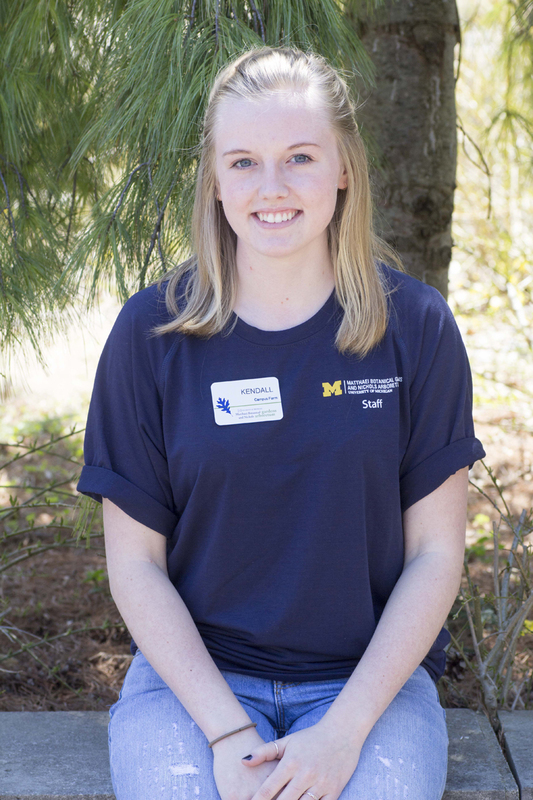 As a Campus Farm intern she participated in improving food access for the local student community, and she learned more about sustainable agriculture. 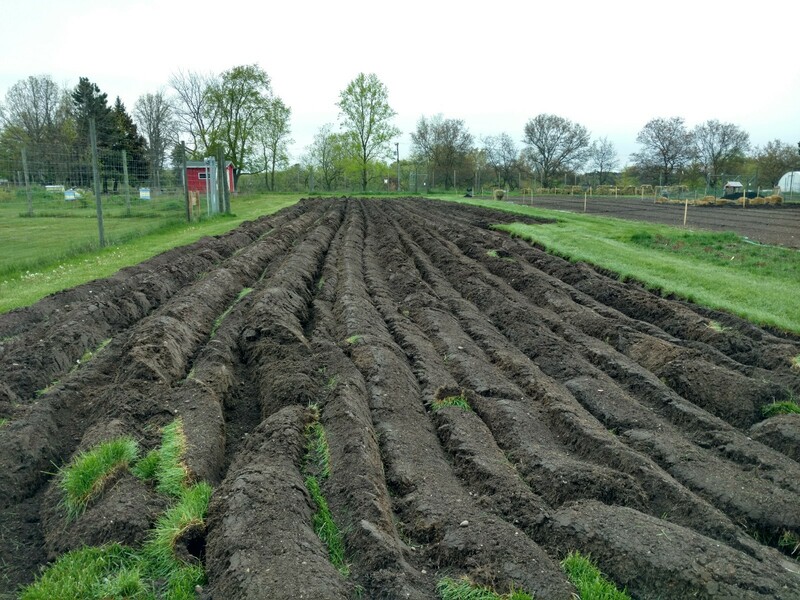 Kendall’s internship was made possible by donors of the Campus Farm.